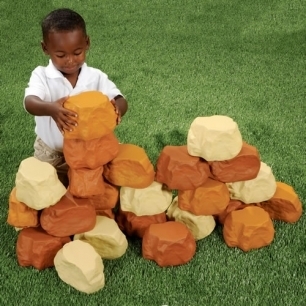 A fantastic collection of realistic pretend bricks, blocks and rocks! Weather-proof and lightweight, these unique foam builders stack easily for endless creative building projects. Cinder Blocks set includes 20 pieces, Rock Wall Builder set contains 25 pieces, Brick Builder set contains 25 pieces, and the Ice Brick Builder set contains 25 pieces.